Crude picked up some sizable gains yesterday amid what appeared on first-face to be a bearish EIA report. Prices once again surpassed $53 at yesterday’s close, though remain some distance from last week’s strong Friday close of $53.80. 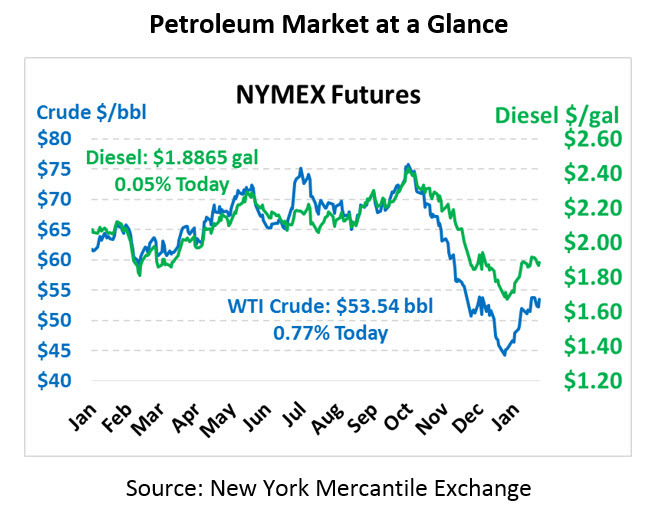 This morning crude prices are trading at $53.54, up 41 cents from Thursday’s close. Fuel prices are trading flat to slightly higher this morning, with the EIA’s report inspiring little activity. Diesel prices are currently trading at $1.8865, hardly changed from yesterday’s close. Gasoline prices are $1.3930, up half a cent. Yesterday’s EIA report was overall bearish for prices, but could not counteract the reported small draw in Cushing OK crude stocks. 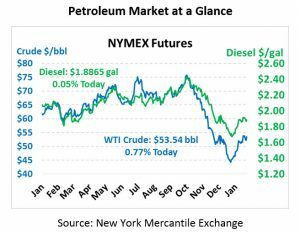 Cushing’s importance to the physical WTI contract caused prices to rise even though national crude stocks were up by 8 million barrels. Diesel stocks were slightly negative, keeping upward pressure on diesel prices. Gasoline stocks climbed 4.1 million barrels to 259.6 million barrels, the highest gasoline inventory level since the EIA began tracking inventories in 1990. The EIA also released their Annual Energy Outlook yesterday, which forecasts US production to continue rising from 11 MMbpd today to roughly 14 MMbpd in the next decade. The report also predicts America’s potential to be a net exporter of energy by 2020 as nat gas and crude oil exports rise. Of course, being a net exporter does not mean we won’t be reliant on imports – infrastructure will dictate that some areas of the country import fuel and gas while other areas export. In the power arena, natural gas and renewables are expected to dominate in the coming decades, at the expense of dwindling coal and nuclear power generation. 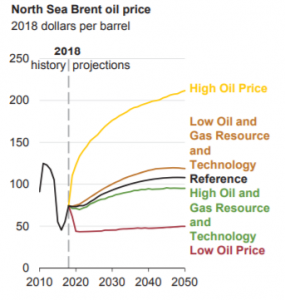 For oil prices, the EIA’s model shows prices trending relatively flat through 2021, then increasing steadily in most scenarios.